The first snowstorm of the season was on its way, and for those of us in the hills of northwest Connecticut, that’s not something to ignore. I tested the snowblower, filled the de-icing salt bucket, and waited for the snow. And then it came, on a frigid Saturday… wimpy, flacid flakes. They kept coming and I kept writing, keeping my eye on the window and expecting some accumulation. By noon, it was starting to thicken, and then it almost looked like it was raining. Noon sets off a bell inside of me on a Saturday. Noon means it’s OK to have a beer. 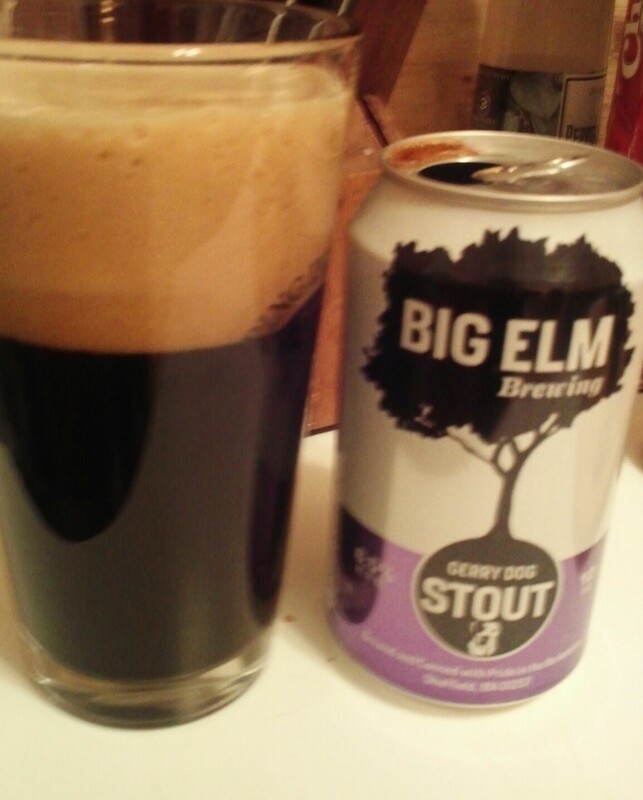 I didn’t want to dive into the beer I’d been waiting for all day: Gerry Dog Stout by Big Elm Brewing of Sheffield, Mass. It knew that if I popped that can and settled into a pint of that warming nectar I’d be way too mellow to wrestle the elements. The moment the snow stopped falling, I went out there and plowed. It was at about two inches, but hey: I bought the machine, I might as well use it. I knew that Gerry Dog was going to be wonderful because I’d already had one on tap, before Big Elm was distributing in Connecticut. Just as I’d remembered, it poured viscous and sweet, with a billowy tan head that shrunk in seconds. It was the dark brown of a loving puppy’s eyes after treat time. This oatmeal stout had a maple sweetness and just enough American hops to nearly balance that out. There wasn’t nearly the carbonation as I remembered the draft having. And while it by no means burned, it definitely promoted a wooziness that belied its 6.5 percent ABV.